As the Obama administration announces new economic measures against Russian officials and companies, the public supports increased U.S. economic and diplomatic sanctions by a 53% to 36% margin. 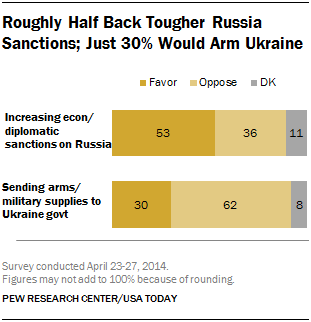 But by roughly two-to-one (62% to 30%), Americans oppose sending arms and military supplies to the Ukrainian government. The new national survey by the Pew Research Center and USA TODAY finds that only about a third of Americans (31%) think that what happens between Russia and Ukraine is “very important” to the United States; 36% say events in the region are somewhat important to the U.S. while 29% say they are not too important or not at all important. The survey, conducted April 23-27 among 1,501 adults, finds only modest partisan differences in opinions about U.S. policy toward the crisis in Ukraine. Comparable percentages of Republicans (55%) and Democrats (58%) favor increased sanctions against Russia and majorities in both parties oppose arming the Ukrainian government. There are much larger partisan differences in opinions about Barack Obama’s handling of the crisis. More than half of Republicans (55%) say Obama has not been tough enough in dealing with the situation in Ukraine, compared with 33% of independents and 23% of Democrats. These views have remained steady over the past month. Currently, most Americans are aware of the ongoing tensions between Russia and Ukraine. Still, fewer than half (46%) say they have heard a lot about the situation; more say they have heard either a little (34%) or nothing at all (20%) about this situation. There are substantial demographic differences in opinions about increased economic sanctions against Russia. College graduates, older Americans and men – who are more likely than other groups to have heard a lot about Russia-Ukraine tensions – are among the most supportive of tougher economic sanctions against Moscow. The differences are less pronounced in opinions about sending arms and military supplies to the government of Ukraine. Majorities across most major demographic groups oppose providing military assistance to Ukraine. People who view the situation in Russia and Ukraine as very important to the interests of the United States (31% of the public) are far more likely than those who view it as less important to favor increased sanctions against Russia and providing arms and military to Ukraine. Fully 73% of those who say events in Russia and Ukraine are very important to the U.S. favor additional sanctions and 48% support arming the Ukrainian government. Among the much larger share of the public (65%) that sees the situation there as less important to the United States, 46% support increased sanctions and just 23% favor providing arms and supplies to Ukraine. Obama continues to receive mixed reviews for how he is dealing with the situation between Russia and Ukraine. Four-in-ten (40%) say he is handling things about right while 35% say he is not being tough enough; very few say he is being too tough (6%) and 20% are unable to offer a rating. Opinions on this questions remain highly partisan, with a majority of Republicans (55%) saying he is not being tough enough. 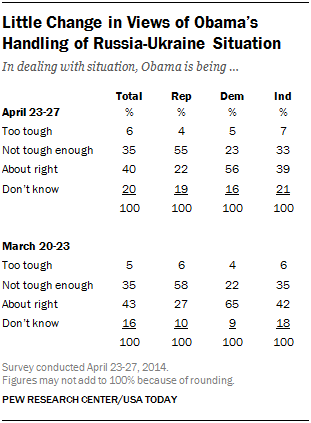 Democrats back Obama’s approach to the dispute, with 56% saying he is handling things about right. Roughly a Third Sees Ukraine Crisis as Very Important to the U.S.
About three-in-ten (31%) say what happens between Russia and Ukraine is very important to the interests of the U.S., 36% say it is somewhat important and 29% say what happens in Ukraine is not too or not at all important to the U.S.
Republicans (40%) are more likely than Democrats (30%) and independents (27%) to say that the situation involving Russia and Ukraine is very important to U.S. interests. Young adults under 30 are among the least likely to view the situation as very important to the U.S.: just 20% say this compared with about four-in-ten of those 50-64 (41%) and 65 or older (38%). College graduates are much more likely than those with less education to say they have heard about the situation between Russia and Ukraine. However, they are no more likely to say what happens in Ukraine is very important to the interests of the U.S. (roughly three-in-ten across education levels say this).